Super Bowl LIII is nearly upon us. We've had two weeks of hype, chatter, and buzz around the game that's about to unfold. Most of the attention has been focused on the players and coaches, but what about the team owners? Robert Kraft and Stan Kroenke have owned the Patriots and Rams for a long time, but they took vastly different paths to get here. And now, they're one win away from getting to brandish a Super Bowl ring. Kraft initially pursued a career in politics. He graduated from Columbia in 1963 and received an MBA from Harvard in 1965. He planned to run for Congress in Massachusetts but ultimately chose not to, fearing a lack of privacy and political pressure. Instead, Kraft joined the Rand-Whitney Group, a packaging company owned by his father-in-law. Kraft gained controlling interest of the company in 1968, when he was only 27 years old. To this day, he still serves as the company chairman. In 1972, he founded Forest Products on a gut feeling – he felt that with more people communicating internationally and traveling around the world, there'd be an increase in global trade. Kraft was right: Forest Products and the Rand-Whitney Group are the largest privately held paper and packaging companies in the United States. Kraft got an early taste of team ownership when he purchased the Boston Lobsters of World Team Tennis. He and five others owned the team for five years, aggressively spending to sign top players of the time. The team eventually folded, with the league also dissolving soon after. While running his companies, Kraft also invested in New England Television Corp. He quickly rose up the ranks, becoming a director of the board a year after investing, and president of the entire corporation just three years later. Kraft sold his shares for $25 million in 1991. Kraft became a season ticket holder for the Patriots in 1971, and he began a plight to own the team in 1985. First, he bought a 10-year option on Foxboro Raceway, which was right next to the stadium. Then-owner Billy Sullivan, who had made a number of bad investments, was unable to hold non-Patriot events at Sullivan Stadium while races were being held at Foxboro Raceway. That combination of issues led Sullivan to sell controlling interest of the team in 1988 and put the stadium into bankruptcy. Kraft pounced on the opportunity. He bought the stadium for $22 million, and his purchase came with the stadium's lease to the Patriots, which ran through 2001. Sullivan and new majority owner Victor Kiam tried to move the team to Jacksonville before the lease was up, but Kraft wouldn't allow it. Kiam ended up selling the team to James Orthwein, who almost immediately looked to move the team to St. Louis. Orthwein sent Kraft an offer for $75 million to buy out the remainder of the Patriots' lease at the renamed Foxboro Stadium. Once again, Kraft turned the offer down. In 1994, Orthwein looked to sell the team, since he didn't want to remain in New England. 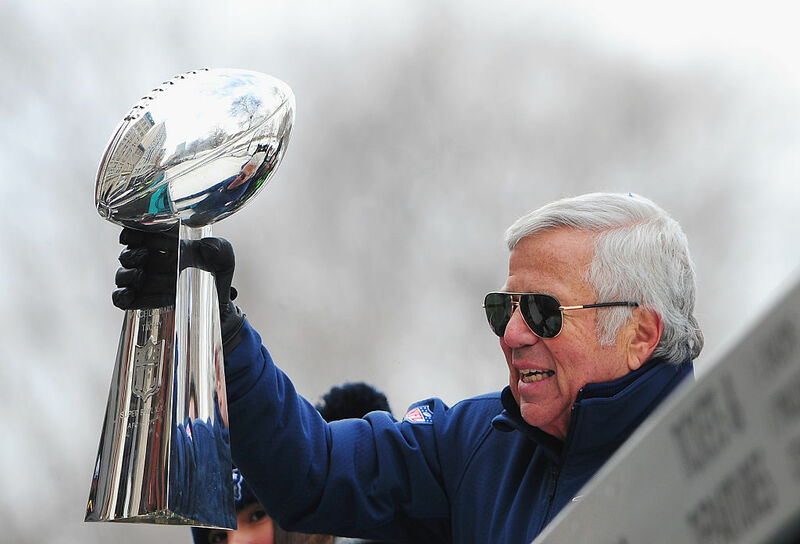 Kraft offered to purchase the team outright for $172 million – the most an NFL owner had ever paid to own a team. Orthwein accepted his offer, and Kraft finally had a professional sports team to call his own. Kraft's infectious passion for the Patriots has rubbed off on the team's fans. The Patriots sold out the 1994 season – the first time they had ever had a sellout for a full season. They've sold out literally every single game they've played ever since. Kraft himself nearly moved the team to Hartford towards the turn of the century, but instead worked to keep the team in Foxboro with a new stadium. In 2002, CMGI Field – now known as Gillette Stadium – was built for $350 million. Five years later, Kraft developed Patriot Place, a shopping and entertainment center that cost $375 million to build, but provides dining, shops, and a museum for fans to enjoy. Since Kraft became owner, the Patriots have been to ten Super Bowls, winning five of them. Besides the Patriots, Kraft also owns the MLS's New England Revolution and eSports team Boston Uprising. Kraft and his family have also donated more than $100 million to philanthropic efforts like education, child and women support, and youth sports. Rams owner Stan Kroenke, meanwhile, grew up in the small community of Mora, Missouri – population: about 25 people. His first job was as a floor-sweeper at his father's lumber yard. After getting a B.A., B.S., and MBA at Missouri, Kroenke met and married Walmart heiress Ann Walton. Kroenke has found most of his success in real estate. With help from Walton's background and connections, Kroenke founded and developed the Kroenke Group in 1983. The real estate development firm focuses on building apartment buildings and shopping centers, and many of its developments are located near Walmart stores. He also founded THF Realty in 1991, another real estate company that works in suburban areas. The company has worked on more than 100 projects and is worth more than $2 billion. Outside of real estate, Kroenke has also invested in wines – he owns the Screaming Eagle winery in Napa Valley – and owns close to a million acres of working ranches. He's also got a verifiable bounty of sports teams. Kroenke's first foray into sports was with the Rams. He helped then-owner Georgia Frontiere move the team from Los Angeles to St. Louis, purchasing a 30 percent stake. Kroenke knew he wasn't done making moves, though, so he created his holding company, Kroenke Sports & Enterprises (KSE). The company, which is celebrating its 20th anniversary this year, has control over five major sports franchises and significant interest in a sixth. Kroenke bought two teams in one year when he purchased the Denver Nuggets and Colorado Avalanche in 2000. He added the AFL's Colorado Crush to his portfolio in 2002, though the team folded six years later. In 2004, Kroenke bought the Colorado Rapids of MLS and the Colorado Mammoth of the National Lacrosse League. 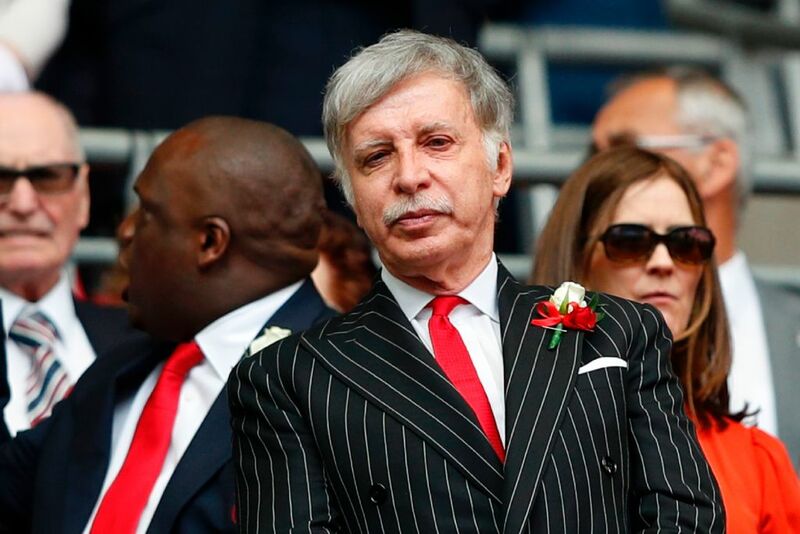 He also owns the Premier League soccer team Arsenal, going from a 9.9 percent stake in 2007 to full ownership in 2018 – a move that cost him about $786 million. And just like Kraft, Kroenke has invested in eSports, becoming the owner of the Los Angeles Gladiators in 2017. Though the Rams were Kroenke's first investment, he had to wait 15 years before he could purchase the team fully. He became full owner in 2010 after Frontiere's death. In order to fully own the Rams, he had to give up majority control of both the Avalanche and the Nuggets, since the NFL doesn't allow owners to control teams in different markets. Kroenke's wife now owns the Avalanche and Nuggets, and his son runs the teams' operations. Kroenke initially said he wanted to keep the Rams in St. Louis, but soon after gaining full control of the team, he began planning for a new stadium in the Los Angeles area. The NFL approved the move in 2016, and the Rams have been in L.A. ever since. Thanks to their meticulous work and focus, Kraft and Kroenke have each become billionaires, worth $6.2 billion and $7.7 billion. That's plenty of money to worry about, but come Sunday, they'll both be focused on just one set of numbers: the final score of Super Bowl LIII.